Size of Baby: A sweet potato! Weight Gain: I had a big growth spurt (Camden too!) these past few weeks and feel like I've officially "popped"! Before it looked more like a food belly, but now people are noticing an actual bump. Woo-hoo! Up a total of 9-10 lbs from my pre-pregnancy weight. Maternity Clothes: Still using this band on my pants that I found at Target! My shirts are becoming more snug and I want to be comfortable in what I'm wearing everyday, so a maternity only shopping trip is happening soon. Symptoms: My headaches are still happening and are really bad when they strike. During one, I was sensitive to light and it hurt to even keep my eyes open and head up, it was terrible! I haven't had one in the past 4 days though (knock on...keyboard? ), so I'm trying to stay positive. Not really any other symptoms going on other than a growing waist! Cravings: Nothing too crazy lately but I'm still loving any and all carbs...in particular waffles and Auntie Anne's pretzels. Can't even walk by or go into the mall without buying one! Mood: Grateful, thankful, happy, excited...you name it. Also, Billy is finishing installing the board and batten tonight! He only has one small wall left then all that will be left to do is paint it, which shouldn't take very long but will have to be done after our trip to Charleston (yay!). Movement: Yes! I always feel him at night when I'm laying really still on the couch. It's noticeable enough for me, but not enough for Billy to feel quite yet! I can't wait to be able to feel him more! Workouts: On the days I don't have headaches, I can get a workout in and it feels so good! I'm going to the gym about 3 times per week now, and trying to do something active whether it's walking or bike riding with Billy on the weekends. What I Miss: The only thing I can think of would be a good run. I'm not really missing anything, but my workouts are less intense and since I enjoy fast paced workouts I'm not really having those anymore because obviously I don't want to wear myself out. 1. Having our 18 week appointment at the doctor's to find out that Camden IS really a Camden, is healthy, and right on track! It was a major relief since this was a really important scan where they look at the brain, spine, heart, etc. We are so thankful! 2. Sharing all about baby boy, his name, and celebrating with our family and friends. Looking Forward To: Going on vacation to Charleston, SC SO SOON!!! What's better than that?! I'm really excited to get away for a bit to relax, unwind, spend time with Billy, and head to the beach! Wondering about finding out the gender early / 3D ultrasounds? I've been really looking forward to sharing about this whole experience. I can't recommend doing a 3D ultrasound (at Ultrasona for you Columbus gals!) enough during a pregnancy. No offense to the standard monitors/ultrasounds at normal doctors offices, but seeing your baby in 3D (and able to count fingers, toes, and see it's mouth move up and down!) on a HUGE flat screen TV completely blows them out of the water. You can't even compare it. The experience was much more personal and comfortable than being in an office! In our specific location, the room was massive and even had a sectional to fit family members in case you wanted to bring them along. Our tech who was doing the ultrasound at Ultrasona was so informative and made the experience that much better for us by answering all our questions and pointing out all his features without rushing us. You can see your baby's features way more clearly (which in turn leads to better peace of mind for momma! ), and most of the time you can get a CD or DVD included in the package. On our DVD they included our whole session on it and put a cute background song to it...I absolutely love watching it and it's nice to have to show our families! We loved it so much we plan to go back around 28 weeks to see him again when he's bigger, and I heard that around this time you can get a really clear picture of what he/she looks like since all the features are developed and they're much bigger! So neat. If you're wanting to find out the gender early or just want to see your baby in more detail or in a special way, this is what you'd want to do! Yay for nursery progress! Love the colors you chose! Love the nursery colors and glad you're still sleeping well! As for the headaches, try a little bit of caffeine when they strike (like the amount in a can of soda). That really helped me when I got them while pregnant! 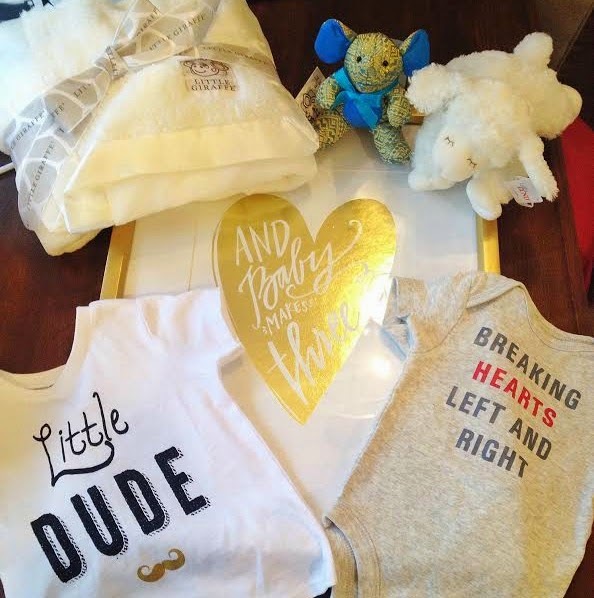 Love the bump and color scheme for your little guy! This makes me excited to "pop" because right now it just looks like I ate too many donuts! haha Feeling him kick must be amazing! So exciting!! Looove his name that y'all picked out!! Matt & I are going to do a 3D ultrasound later in the pregnancy too & I cannot wait!! I have a friend who did it here to also find out the gender early & she highly recommends the place! Hearing your experience makes me even more excited! Love the nursery colors also! They're so fresh & bright! I have some pinned similar if we find out it's a boy! Love the name!! Headaches are no bueno I agree with your first commenter to try a little bit of caffeine (although my vice is an iced coffee) Happy to hear your are feeling great! Love those colors! Your lil baby bump could still pass for a food baby to the untrained (non-fellow-pregnant) eye :-) Yay for a great 18w ultrasound! I know this is going to sound crazy but lavender and/or peppermint essential oil is great for headaches and won't harm you or the baby! Let me know if you would like more information, I'd be happy to share! Love the nursery colors, and the name! So precious! So exciting!! That heartbreaker onesie is too cute!!! Love the name and the nursery colors you chose!! 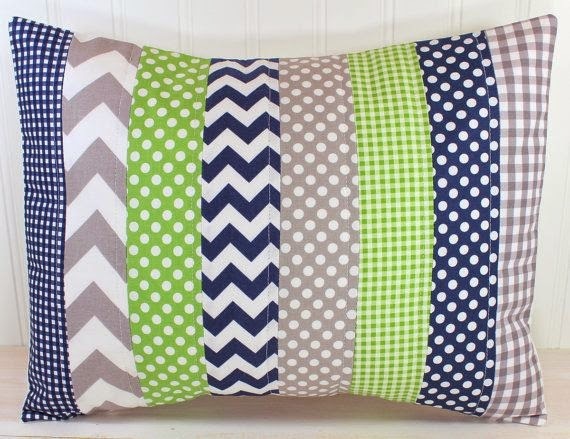 We did navy, lime green, teal and gray in our nursery, and it's by far my favorite room in our house :). I also had Camden at the top of my list, but my husband vetoed it :(. So exciting! We didn't do a 3-D or 4-D ultrasound, but it sounds like you get a good view of the baby. Excited to see how the nursery comes along! I am 21 weeks and hubs felt the babe last night for the first time, it was so sweet. Glad you are feeling well! 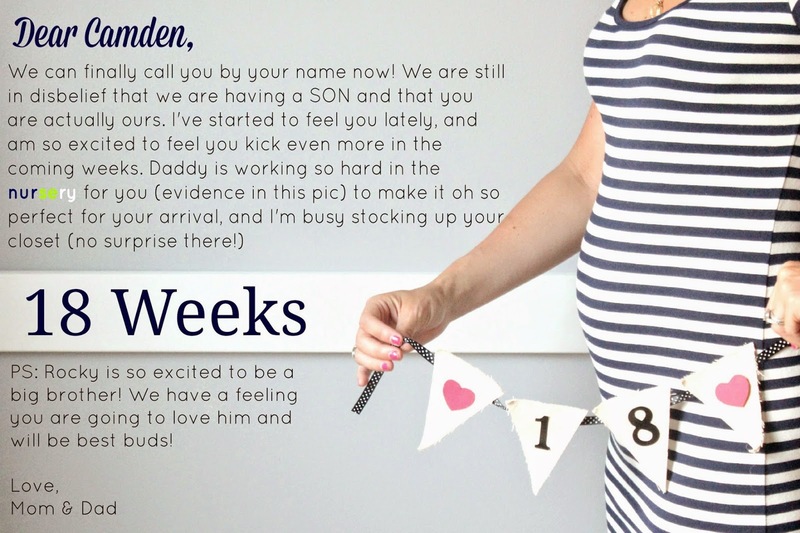 LOVE the nursery colors and your little sweet message in your picture. All so very sweet...Congratulations! I'm going to need a full Katie baby bump pic - text me! HAHAHA :) Seriously though - how are you this far along already??? I can't wait to see the nursery. I know you'll make it adorable!